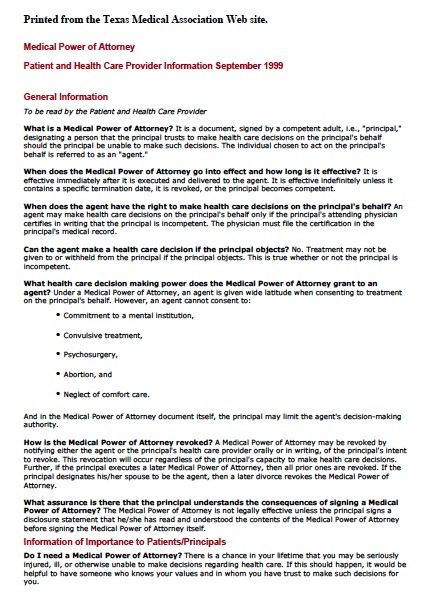 The medical power of attorney allows the principal to authorize an agent to make a range of healthcare decisions for the principal if the principal lacks the capacity to make them. The agent must make these decisions according to the principal’s instructions and personal beliefs. Here, it is crucial to pick someone you know will respect your beliefs and wishes and discuss potential medical scenarios with the agent. You should also be sure the person would be willing to advocate on your behalf and weigh risks and benefits of certain medical procedures. The standard form in Texas grants the agent power to make any healthcare decision, including any procedure or treatment to maintain, treat, or diagnose a health condition, as well as withdrawing or continuing life-sustaining treatment. The agent may not consent to voluntary inpatient mental health services, abortions, psychosurgery, or convulsive treatment. In Texas, you must have two witnesses or a notary sign the form to make it valid.